Prominent leftist politician Hamdeen Sabbahi announced on Saturday that he will run for president in this year's elections. Sabbahi, who finished third the 2012 presidential race -- behind eventual winner Mohamed Morsi and Hosni Mubarak-era premier Ahmed Shafiq -- announced his candidacy at an event in Cairo. The founder of the Popular Current group has more than once expressed his intention to run for president over the past few weeks. He is the first to confirm that he would seek the 2014 election. Speaking on Saturday evening, Sabbahi said he would cooperate with anyone in the upcoming presidential race except those "who consider the 30 June protests a coup, or the 25 January revolution a conspiracy." Days of protests starting 30 June last year led to the overthrow of Morsi, while the 2011 January uprising ended Mubarak's 30-year rule. It is Abdel-Fattah El-Sisi who is, however, widely tipped to be Egypt's next president, after the Supreme Council of the Armed Forces empowered him to run for the top position last week. El-Sisi, who is yet to officially announce his presidential candidacy, has grown immensely popular after the military ouster of Morsi on 3 July, following mass protests across the nation against the latter's rule. 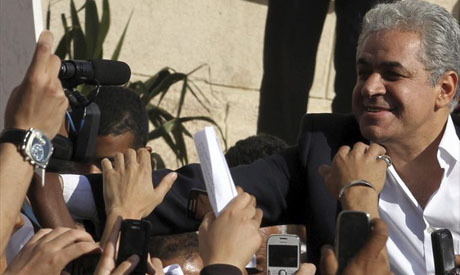 Elections are expected to take place before 18 April, according to a recent decree by President Adly Mansour. Mansour decided to bring presidential elections forward, changing an initial roadmap drawn up following Morsi’s ouster which would have seen parliamentary elections take place first. The Popular Current will hold a press conference soon, Sabbahi said during his announcement.